The state of Maine is the largest in all of New England, with over 15 million acres of land. Maine’s seacoast stretches for 3,478 miles—more than 50 miles longer than the state of California! Lighthouses dot the rocky beaches, lobster shacks offer fresh catches and outdoor activities abound. The seaside towns in Maine truly embody “the way life should be,” or, to put it better, the way gluten-free life should be! Here’s a taste of what delicious and fun gluten-free options are waiting for you along the seacoast of Maine. As you cross the border from New Hampshire into Maine on I-95, the first town over the bridge is Kittery. 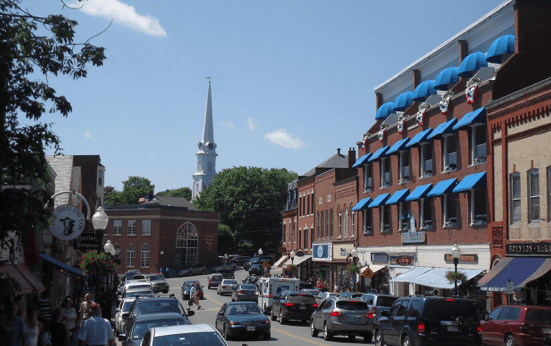 Kittery is home to a US Navy Base on Seavey’s Island and excellent shopping. The Kittery Outlets are your best option for discounts, especially at Maine stores like L.L. Bean. You can also visit the Kittery Trading Post, which has outdoor equipment, clothing, and supplies. For a great gluten-free sandwich, try Henry VIII Carvery. This lunch stop has hand carved roast beef, turkey, and pork sandwiches available on tasty gluten-free rolls. If you’d rather have seafood and a true New England classic – a lobster roll, look no further than Robert’s Maine Grill. The staff is cognizant of gluten-free dietary needs and cross-contamination. Having a gluten-free lobster roll is a must when visiting Maine! Continuing north another 10 minutes on I-95 is the small town of York. York is well-known for its famous lighthouse, Cape Neddick. 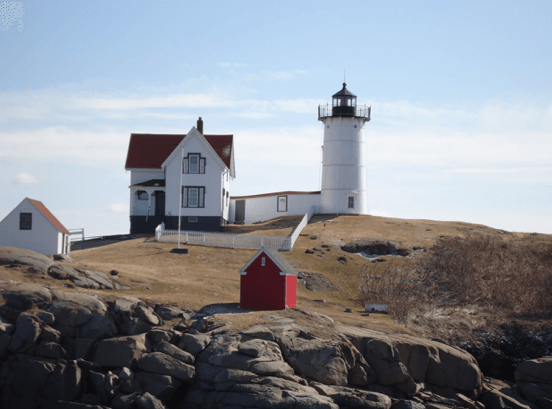 This popular tourist attraction is more commonly referred to as Nubble Lighthouse, due to its location on Nubble Island. The lighthouse has been in use since its dedication in 1879. One of the best parts of York in addition to this charming seaside lighthouse is a restaurant that most people with celiac disease can rarely attend. If you are gluten-free, you are aware of how challenging eating at a Chinese restaurant can be, due to the presence of soy sauce and cross-contamination. At Greenleaves Chinese Restaurant in York, your dreams of enjoying gluten-free Chinese food can come true! Greenleaves has a separate and extensive gluten-free menu as well as high standards in their kitchen. Not only do they utilize special labeling and plates for their gluten-free dishes, but they also have a dedicated gluten-free cooking space and pay close attention to hidden locations for cross-contamination. With gluten-free options like sushi, fried rice, miso soup, and more, this Chinese restaurant is definitely worth the trip to York! Another 10 minute drive on I-95 north is the town of Ogunquit. Ogunquit is well known for its pristine beaches and adorable Bed and Breakfasts. Nicknamed “Beautiful Place by the Sea,” it’s been called one of the best beach towns in Maine. In addition to being known as one of the best beach towns, Ogunquit also has some of the best gluten-free food. At Roots Cafe & Bistro, you can enjoy many items from the gluten-free menu for brunch, including house made granola, egg sandwiches, or a Maine twist on a classic brunch item: Lobster Benedict. To dine seaside, try The Trap. They offer seating outside on the patio that overlooks the beach. This restaurant also has a dedicated fryer for items like fried oysters and crab cakes made gluten-free! The Trap has a separate gluten-free menu as well as gluten-free buns for their sandwiches. For a sweet treat, check out Rococo Ice Cream. This ice cream shop offers handcrafted ice cream that rotates through fourteen different flavors every day. They also have gluten-free cones and will carefully adhere to requests for fresh tubs of ice cream and clean scoops. Portland is one of the biggest cities along the seacoast with an outstanding gluten-free scene, including 100 percent gluten-free restaurants! From Ogunquit, Portland is a 45 minute drive north on I-95. 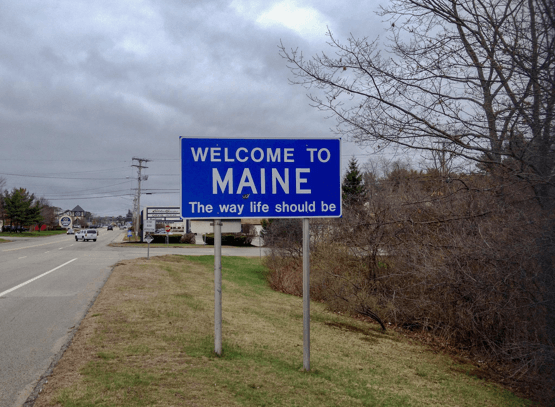 It’s the most populous city in the state of Maine and an excellent weekend getaway for celiacs. It’s another fabulous destination and boasts live music, local festivals, art museums and nautical history. Bam Bam Bakery is well known for their fantastic desserts and for being a dedicated gluten-free facility. Besides baked goods they also offer breakfast sandwiches, scones, snacks, and more! If you visit any Portland supermarkets, check for Allergeena Gluten-Free Baked Goods. They are made by a small business owner in South Portland who also eats gluten free. 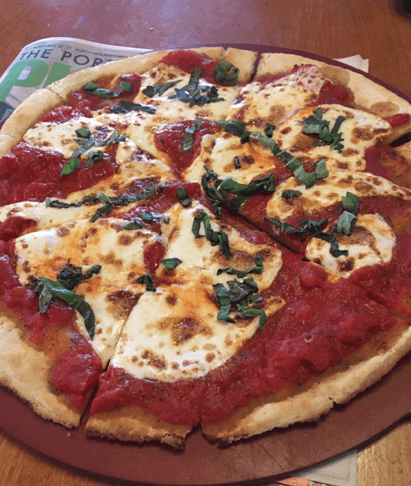 Lunch and dinner options in Portland include the Portland Pie Company for some wonderful gluten-free pizza, MAÍZ Colombian Street Food, where everything on the menu is gluten free, and for a special treat, The Holy Donut. 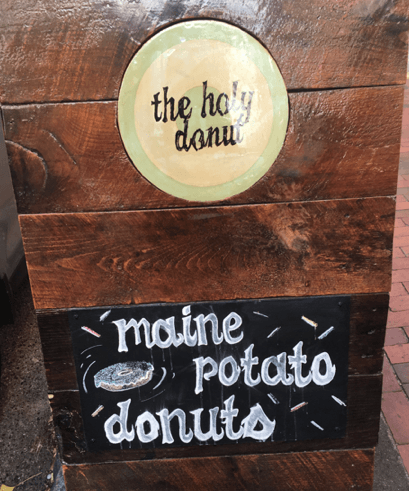 This place is quintessential Portland— freshly made potato donuts with all different flavors and a special selection of gluten-free donuts as well. On your drive to Camden, make sure to stop in at Wildflours Gluten-Free Market & Bakery in Brunswick. It’s adorable and scrumptious- and their prices are very reasonable for gluten-free products! It will take you approximately a half an hour to get there from Portland on I-295. Continuing an hour and 20 minutes up the coast will bring you to the charming town of Camden. Camden overlooks Penobscot Bay and has various walking trails. 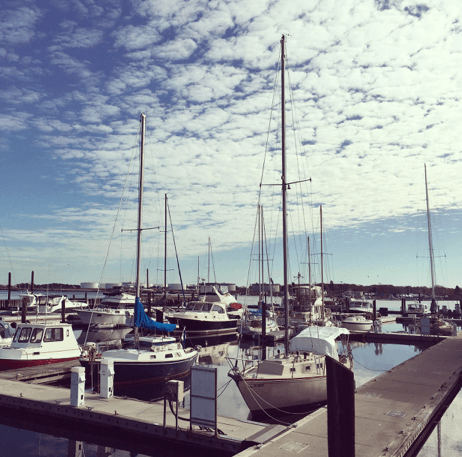 It’s known as the “Jewel of the Coast.” You can stroll the historic district on High Street, hike Mount Battie, or maybe catch an outdoor concert at the Harbor Park & Amphitheatre. If you can stay at the Windward House B&B, it’s worth a try. They cater to those with celiac disease and go above and beyond in their breakfasts. If not, check out the Camden Bagel Cafe for fresh Udi’s gluten-free bagels and various cream cheeses for a yummy start your day. For lunch or dinner, the Sea Dog Brewing Company has locations throughout New England, including a spot in Camden. They offer gluten-free ciders, gluten-free buns for their burgers,and a detailed gluten-free menu. You can also dine by the water for stunning views and gluten-free options at Waterfront Restaurant. Waterfront’s menu includes gluten-free seafood and salads. 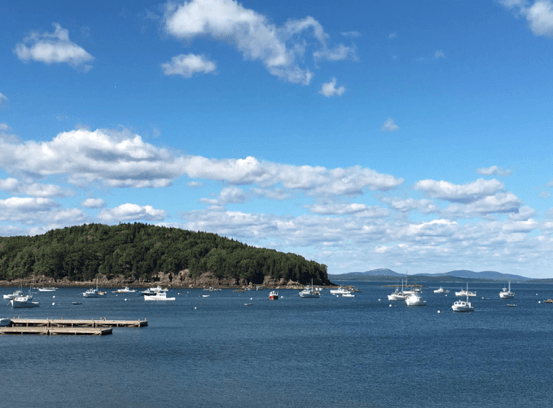 Bar Harbor is the closest town to Acadia National Park, located on Mount Desert Island. Heading north along the coast from Camden, it will take a little less than two hours of driving time. Acadia is a beautiful spot for camping among the Maine pine trees while still in close proximity to the beaches and ocean. In the town of Bar Harbor, there are various activities such as kayaking, bike riding and hiking. Bar Harbor and Acadia are a wonderful vacation spot for couples, families, and groups of friends. If you enjoy camping, stay at Blackwoods Campground for a few nights. 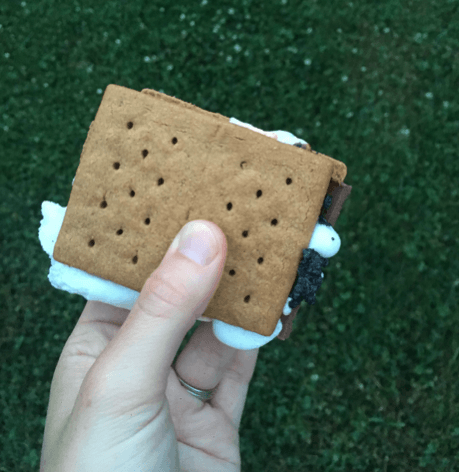 You can hear the waves from your campsite as you relax by the by the fire enjoying a gluten-free s’mores— just bring your own graham crackers! Geddy’s Restaurant in downtown Bar Harbor has an outstanding gluten-free menu with fried options that seem too good to be true! From gluten-free nachos to gluten-free fish and chips, Geddy’s does a solid job with their dedicated fryers and foods. This restaurant provides any gluten-free customer visiting Bar Harbor a chance to enjoy classic comfort foods—without the stomachache. For a healthier option, Thrive Juice Bar has clean eating down pat, including smoothies, green juices, quinoa bowls and salads. They are keenly aware of cross-contamination prevention and know what foods and drinks are safe to order off the menu. The Side Street Cafe is another gluten-free friendly place and one of the best stop for food in Bar Harbor. This restaurant is off of the main drag and their decor is funky, but fun. The tables themselves look like shadow boxes with Maine related souvenirs and memorabilia inside. Their macaroni and cheese is outrageously good, and you can make this a true Maine dish by adding an extra ingredient: lobster! The gluten-free scene along Maine’s seacoast won’t leave you disappointed or hungry. No matter what charming beach town you choose to visit, you’ll have a chance to embrace Maine and enjoy the way gluten-free life should be.